California citrus production has surpassed Florida and has taken over as the newest leader for American citrus production. Forecasts also indicate that California will continue in its new position as Florida continues to deal with hurricane aftermath and continued disease pressure. According to the U.S. Department of Agriculture, California growers sold about 3.9 million tons of citrus during the 2016-2017 marketing season. Florida farmers sold 3.5 million tons during the same period. It has only been five years since Florida produced twice the amount of citrus as growers in California. 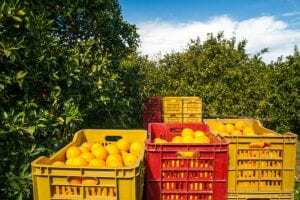 According to the University of California Davis, it would be the first time that California has outperformed Florida citrus in more than 70 years. California fresh orange production actually decreased 14 percent, but Florida production has taken such a severe hit from Huanglongbing disease, coupled with the damage of hurricane Irma, that California will be leading American citrus production for a while. The most recent 2017-2018 forecast for production from USDA indicates that the gap between California and Florida will continue to widen. Projections show that while California’s orange crop will be somewhat smaller, the state will still be producing approximately 3.8 million tons of citrus. Florida citrus production is expected to decrease significantly to 2.3 million tons.